Seven Earthquakes Struck off the West Coast of Northern Sumatra Today. | Chaos Sweeps Away the World We Know! The Disaster, current events & Catastrophe Blog. Forecasts for 2014 to 2022. Read tomorrows news today! Plus current economic, commodities, stock indices and financial news. 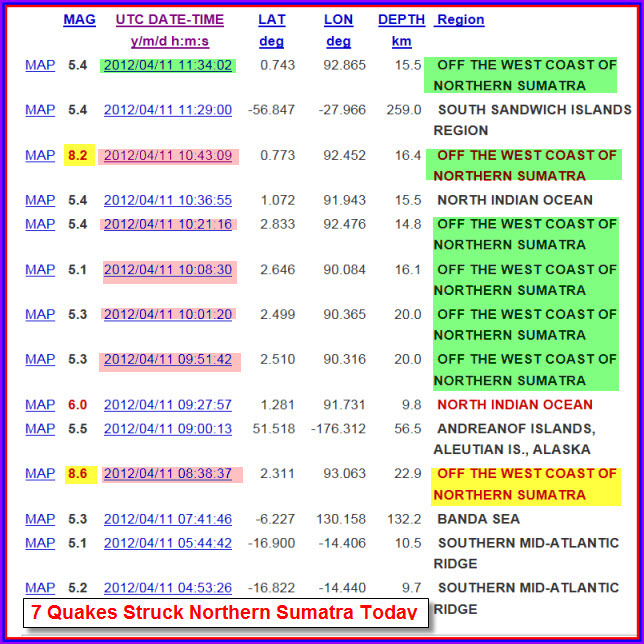 April 11, 2012 – Seven Earthquakes Struck the West Coast of Northern Sumatra Today: Two of the quakes were greater than 8.0 magnitude, one was 6.0 and five were greater than 5.0. This is close to the same location that saw the mega-quake and tsunami on December 26, 2012 that killed over 200,000 people and created massive destruction and carnage world-wide, especially around the Indian Ocean. The details of the quakes are shown in the update graph, from the USGS, shown above. The carnage started at 8:38AM GMT with a massive 8.6 magnitude quake (3:38AM in New York and 12:38AM in Los Angles). Another powerful 8.2M aftershock occurred at 10:43AM GMT (5:43AM New York and 2:43AM Los Angeles). This region is home to more strong earthquakes than any other in the world. Of the 354 tremors, greater than or equal to 6.0 between 1973 and 2012, Indonesia saw 45, Japan 37, Russia 24, the USA 22, the Solomon Islands 19, Chile and PNG (Papua New Guinea) 16, New Zealand 15, followed by Mexico, the Philippines, Vanuatu and China with 14 each. I will continue to post on this extraordinary series of earthquakes throughout the day. This entry was posted in Chile, China, Disasters, Earthquake, Indonesia, Japan, Mexico, Misc, Miscellaneous, Nature, News, Pacific Ocean, Papua New Guinea, Philippines, Russia, The Sandwich Islands, United States, Vanuatu and tagged 8.6 and 8.2 magnitude earhtquake struck off the west coast of sumara april 11 2012, The Master of Disaster. Bookmark the permalink.